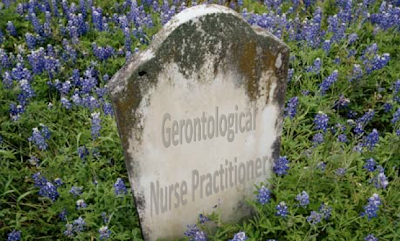 This is the second and last of the Death of the Gerontological Nurse Practitioner series. Part 2 is more aptly titled Death of the Gerontological Advanced Practice Nurse as both the nurse practitioner track and the Clinical Nurse Specialist track have died. For those you not familiar with the topic, Part 1 is here for reference. Well, it finally happened… my colleagues and I recently became the final graduating class of University of California, San Francisco’s (UCSF) Gerontological Nurse Practitioner (GNP)/ Gerontological Certified Nurse Specialist (GCNS) program. Shortly after we began our program two years ago, we received the news that the Gerontological Nurse Practitioner track would be eliminated and that we would thus be the final class to graduate from the program at UCSF. When we first heard the news, we were not only surprised, but also quite nervous about how it would impact us personally, educationally, and professionally. However, after we discussed it amongst ourselves and heard the comforting words of our professors, we became more comfortable and began to jokingly refer to ourselves as “The Last, but not Least, Cohort”. This light-hearted sentiment stayed with us over the course of our two-year program and culminated with our group requesting to be the last of the graduates to walk across the stage at the commencement ceremony. As a member of this “Last, but not Least” group, I was asked to share my views on the ending of the GNP specialty with this blog. After thinking a lot about the subject, I realize just how mixed my views have become. I feel very deeply that the needs of older adult patients are extremely unique and that providers need to receive specialized training and education to care for these patients. Selfishly speaking, I feel blessed to have been admitted to the program while it still existed and feel lucky that I will not have to pursue a post-masters education to receive my specialty. As a nurse who is passionate about older adults, I worry that there will be fewer Gerontological specialists just at the time when the population is growing and becoming more in need of care. This is a wonderful post with thoughtful discourse. I have a job that requires national certification as an NP. I worry about my ability to renew may GNP certification if the non-exam option doesn't work for me. What would my options be? Taking the AGNP exam would require my going back to school in order to add the adult component to my Geri training to keep my current job! My job could be at risk. How are others dealing with this? I have never ever seen such a fabulous dental care blog.You can't even imagine how much I am impressed from this one.Thanks!